All 12 of the new season's episodes, from the skippable to the unmissable (Zach Galifianakis, everybody! ), and back again. Who’s the real star of a talk show: the host or the guests? We’re certainly in a time when networks and services are desperate to find a show where the former is true. With a magnetic, charismatic, powerful person at the center, a show doesn’t have to be dependent on the attraction du jour. Other shows can draw strength from the influx of voices that run through the normal framework of a daily, weekly, or semi-regular show. 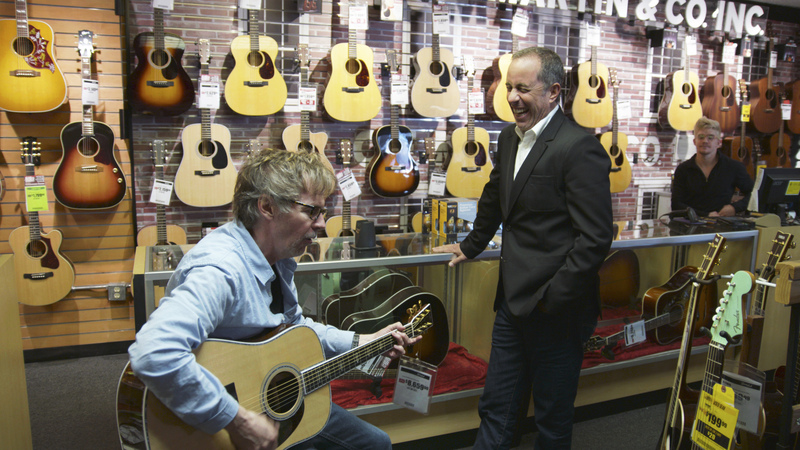 At its best, “Comedians in Cars Getting Coffee” is a blend of both those ideas. 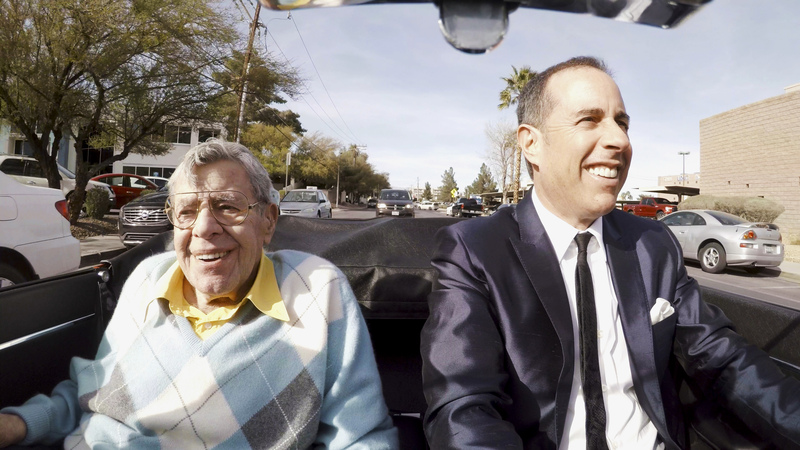 Although the series makes it abundantly clear that host Jerry Seinfeld is often more preoccupied with vehicles than the people who inhabit them, when he can indulge his passions with someone who is a good fit as a co-pilot, the result can be magical. Now that the series is part of the Netflix domain, some of the show’s past restrictions have been lifted: Without product placement consideration or an imminent project for guests to pitch, there’s a more casual feel to the way these are put together than before. Making a Frankenstein edit out of an afternoon’s worth of conversation is never an easy task. But over the course of the dozen new episodes now available to stream as part of the show’s fifth collection (or ninth season, depending on your preferred nomenclature), it’s evident how much more sway the guests have than before. 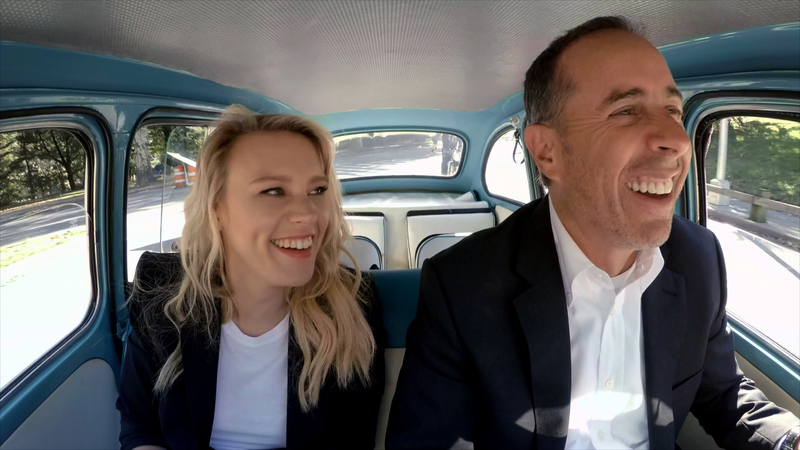 Old friends and new acquaintances alike take rides along with Seinfeld and this newest gathering of episodes, and it’s easy to see the host’s waxing and waning interest over the course of each installment. And even at 15 minutes, these are still espresso-sized sips of an unscripted project rather than giant gulp. Still, time is precious. If you’re new to the show or have neutral opinions on the roster of talent in this year’s season, we’ve done our best to organize all 12 episodes by worthiness of taking a spin. Below we listed them out, from passable to most worthy of your time. Regan and Seinfeld are kindred spirits of sorts. In fact, they’re so similar in their observational style and general outlook on life that this loses a lot of the contrast that makes an episode of the show worth watching. The two of them are certainly unguarded, but in a way that makes Regan seem more like a life coach than one of the most popular comics in the country. The discussions of going to Alaska to retire, the relative merits of psychiatry, and going to a golf swing analysis center are like a societal removal trifecta. This is the kind of episode that makes you long for a director’s cut. At some point Minhaj and Seinfeld go to a record store, but we never see or hear the rest that conversation. What does make the final version worth watching coasts mostly on Minhaj’s charm, with basketball analogies and a gentle indulgence of Seinfeld’s insistence that more people should care about cars. At the very least, it’s a reminder that Minhaj has some other quality Netflix ways to spend your time (“Homecoming King,” namely) and will have more in the near future. It’s one thing for a comedian in this framework to talk about their past, but to see them interact with it is what can separate out one of these episodes. It’s not a long journey through Chappelle’s past, but seeing him return to his old high school at least provides a fun counterbalance to the traditional coffee segment where Seinfeld and his guest talk about how everything is different these days. Seeing them both workshop a pitch for an unmade Superman show, it manages to put the both of them in their element (even if the subject matter is notoriously Seinfeld’s beloved territory). Even people who live with the benefits of their own comedic legacies and gigantic Netflix deals (and who both claim to not care about their own relevancy) can still be wistful about ideas that never came to fruition and projects that never came together. Some of these episodes are built around getting more physical performers into situations that let them take advantage of an unfamiliar space. 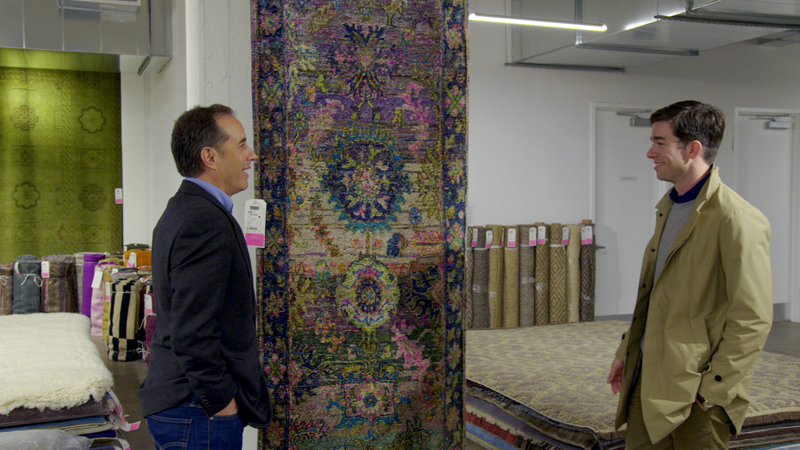 Sending Mulaney and Seinfeld to go buy a rug seems like a mismatch of strength and subject. (Mulaney’s a solid writer. Perhaps you’ve heard.) The two of them make the most of their home furnishing excursion (at least when Seinfeld isn’t busy explaining how he’s responsible for the creation of the American Express black card). Seeing these two compare notes on their respective sitcom experiences, even when the results of their shows were very different, is initially interesting, and Mulaney’s sense of humility butting up against supreme outsized confidence is an interesting dynamic, even if it’s derailed somewhat by the usual Seinfeld refrain that non-comedians don’t know what funny is anymore. 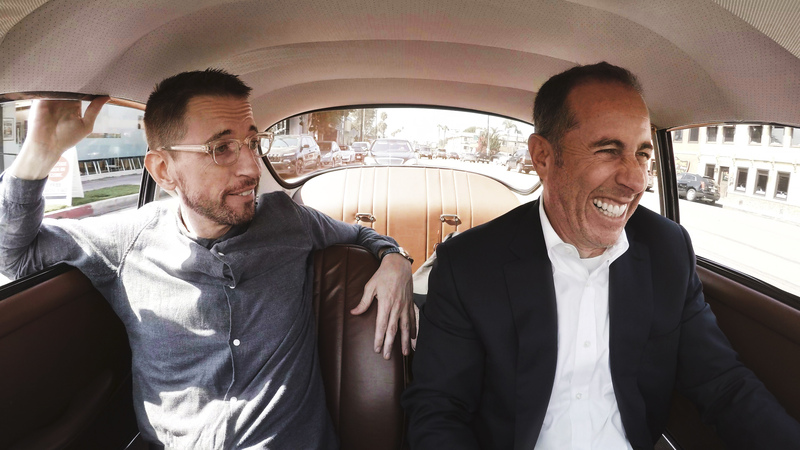 The more you watch of “Comedians in Cars Getting Coffee,” the better you get at spotting the episodes where Seinfeld knows what he’s getting into, whether it’s a friend or someone he’s worked with for the past. Here, it certainly seems like the host of the show is legitimately perplexed by how McKinnon works as a comedian (and even a bit in conversation). The two do find some common ground, even if it takes a detour through a surface-level understanding of weather pattern phenomena. For as many bizarre directions this short conversation takes, none of them are as fruitful and joyous as hearing McKinnon absolutely devour a Scottish accent, much to Seinfeld — and presumably, the audience’s — delight. Usually these episodes go one of two ways: a 15-minute career overview or a discussion of literally anything else. This Carvey segment shows the benefits of not only examining performers’ past work, but digging into the mechanics of how a comic constructs and delivers a joke. The specific compulsion of an impersonator is always a fascinating thing to unpack and while there’s only so much time to dig into it, a passing Regis Philbin and the consideration of what voice to give Kim Jong Un makes for decent conversation. The two of them at a restaurant table dissecting and punching up a punchline is one of the show’s best case scenarios. Add a little bit of “SNL” history in the mix for good measure and you get a solid, process-driven installment. Sometimes you just want to make hear Tracy Morgan make analogies to life through the context of breakfast cereals. Other times, you just want to walk around his house and behold the majesty of his aquarium. Aside from the Richard Pryor references and Morgan acknowledging his accident scare from a few years ago, there’s not much meat to this conversation that’s specific to Morgan himself, but just having him as a comic sparring partner makes having Morgan there a welcome treat. Oh, to see the rest of the footage from that house tour. Alec Baldwin is not an easy person to enjoy, and that’s when he’s playing another character beside himself. Given how much this conversation avoids his tumultuous public perception, you could argue that this is almost another character in itself. But this is a conversation that shows why Baldwin’s continued to work for the last however many years. Gone is a lot of the pomposity from his petty online and talk show feuds, revealing something underneath it that seems much more affable. He’s a good storyteller, he’s got a great sense of timing (as the handing-Seinfeld-his-coffee tag shows), and Seinfeld seems to genuinely like him. It’s a surprisingly modest episode — well, as much as it can be when Baldwin at one point literally stops in the middle of the street to tell a joke and makes an oncoming car wait for him to finish. This is as close as this series gets to an entry-level masterclass, in the best possible ways. For a show that usually nudges its subject to condense their comedic philosophies down into very digestible soundbites, this is one extended conversation that really rewards talking it out. It’s a dueling set of pronouncements about how comedy works and what best embodies it, but there’s a satisfying tension between Seinfeld’s on-high proclamations and Brennan’s more grounded field-level approach. Not many comedians are as averse to sugarcoating things as Brennan is in this conversation. As a result, this lunch trip is even more direct and unguarded than the rest. For a show that can sometimes make transparency seem difficult, there’s a certain value in hearing parts of an in-depth treatise on the subject from two people who are clearly obsessed with it. As the host of one of the most massive talk shows in the world, there’s not a whole lot about DeGeneres that the public doesn’t know. Whether by her choice or via the informality of the setup, she opens up about her both past and present. Talking about the origins of her career, the bleak moments that helped her make some of her biggest breakthroughs are surprising to hear her talk about. Even in heavily edited small doses, you still get a sense of playfulness, especially in a closing bit that, whether scripted or spontaneous, is still one of the highlights of the season. There’s a certain amount of reverence that runs through this whole episode that would be readily apparent even if there was no voiceover. 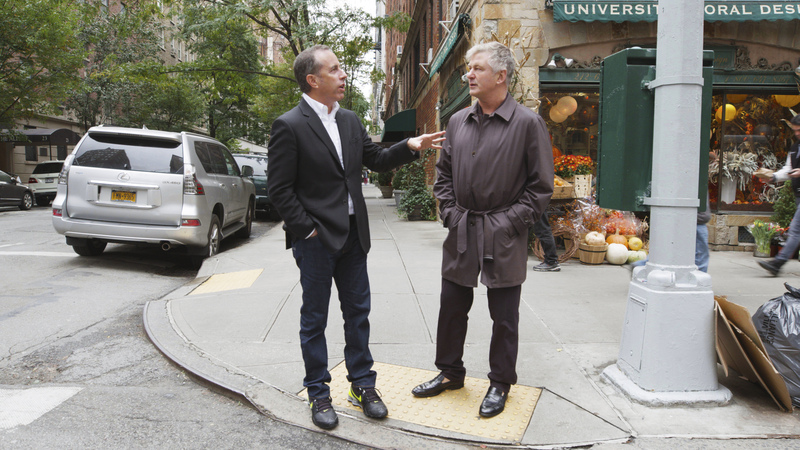 Seinfeld’s body language changes when he’s around the King of Comedy, much more so than with his contemporaries. Still, there’s a mutual respect which keeps this from being a merely one-sided conversation. But most of this — Lewis telling stories about performing live in the Copacabana heyday and the impossible deadlines under which he made some of his most quintessential work — doubles as a tribute in the man’s own words. Of all the people this season, Lewis seems the most genuinely happy to be out on the car ride. It’s a loving farewell to the late performer, with not much oversentimentality to be found. 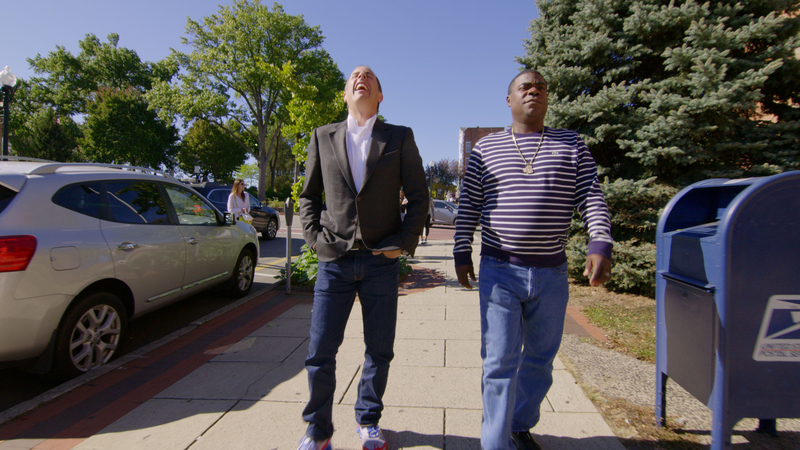 There’s a tricky balance which goes into making a “Comedians in Cars Getting Coffee” episode feel more than wispy. A silly “Jurassic Park”-inspired cold open treads the same line between goofy and sincere that Galifianakis has for the majority of his career, by his own admission. Getting his thoughts on that divide and seeing the internal crisis that can bring about touches on something very real in a very short amount of time. Privacy is something that comes up quite a bit this season, but here it feels like the most honest evaluation of that idea, rather than just one of the people in a conversation performatively downplaying the fact that people recognize them all the time. It’s not just that going to a donut shop instead of a five-star restaurant is somehow more authentic, the conversation that comes out of it feels less forced and more open. No wonder this the first choice in the collection that people get on their Netflix menu. If there’s one major problem with the series as it currently stands, it’s that it seems like this is an exercise in Seinfeld figuring out how different people are from him rather than showing interest in learning about what he doesn’t know. It’s something that’s a fundamental difference between his show and David Letterman’s show. So many of Seinfeld’s conversations come down to gatekeepers and all the people who have unjustifiable sway in the world of comedy. 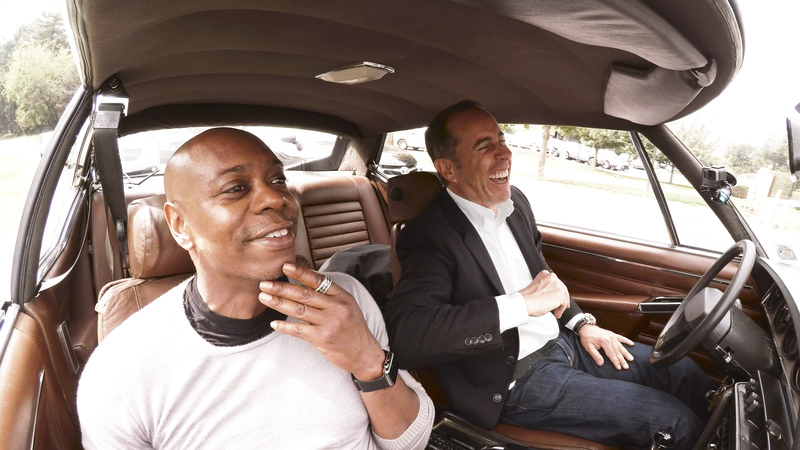 When an episode of “Comedians in Cars Getting Coffee” is a Battle of the Curmudgeons, it saps the whole process of much of what makes it entertaining or informative. But it doesn’t just extend to the guests. In the Tracy Morgan episode, he asks the waitress her name. When it’s one that’s unfamiliar to him, his first instinct is “Why do people keep making up new names?” There’s an art to using comedy to process what you don’t understand. This would seem to be the opposite of that. It’s one moment in the span of a season, but there are tiny hints of that same frustration with having to accept change that weighs down a lot of these conversations. Some of these chats would really sparkle with a bit of genuine inquisitiveness. But the result is something that usually says more about how Seinfeld has discontent for the corner of an industry that made him a literal household name. It brings the show into greater focus when someone in the passenger seat can cut through all that and really make these rides feel like something worth watching. 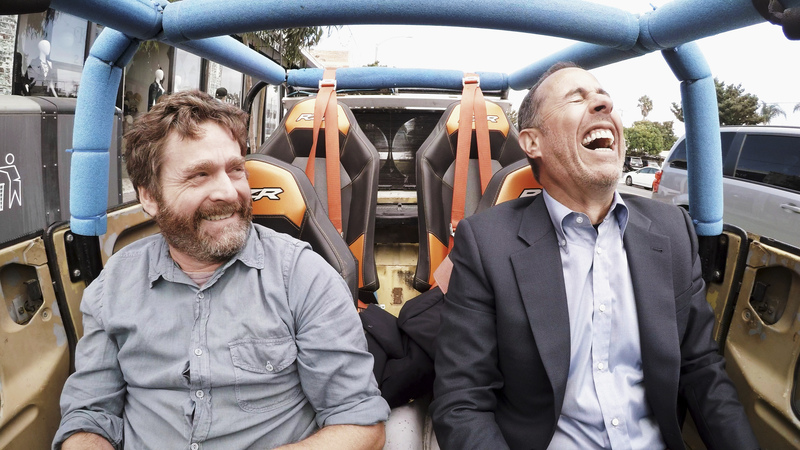 “Comedians in Cars Getting Coffee” is now available to stream on Netflix.